To go on this outing you leave from El Chaltén, or if you have walked to Laguna Capri, you may leave from that place (see outing). It is ideal to wear hiking shoes since this trail is more difficult than the previous one, a debris road with a fall of 300 m . to cover. You must go on through the trail, as in the previous case, and you will see that the forests are open, but anyway, it is necessary to keep to the narrow road to respect the fragile patagonian habitat until you reach Río Blanco. Once in the river a wooden bridge takes you to the other side. There starts the steepest sector of the journey, where you can take your time to stop and look behind. You will be impressed to see all you have walked up to that point, and you will see Laguna Capri from that height. If you go on walking, you will find yourself at the upper limit of the forest, more than 1000 metres above sea level, with shrubby species, and almost in a blink you will be contemplating Laguna de los Tres with its typical turquoise color. This is the right time to have lunch, sunbathe and if you are brave, get into the water. 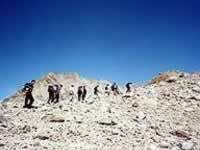 After recovering you walk left, climb a little hill, and very near you will see Laguna Sucia with its grey tones. 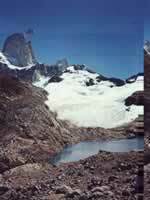 Laguna Sucia is enclosed in a narrow ravine with a cold weather warmed by the sun. You will notice of being in a fresh atmosphere, but that becomes lukewarm with the sun. Although it is not very common they exist windless days and of sky with a deep blue. 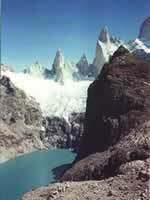 In the whole journey, you will observe the immensity of the Fitz Roy, with their constant presence in the whole walk. You will feel that moves with vos, as if the mountain is in all sides, with its spirit masthead that walks to each walker's rhythm. It is very difficult, to lower until the coast of the dirty lagoon. 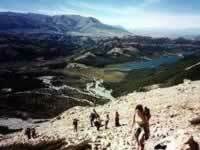 For what you will have to undertake the turn, until the camping site that is in the lagoon Capri , to spend the night.